There are days when extra time to make something from scratch is possible, and other days… when grabbing something premade and turning it into your own creation is the only way. I have mentioned before that I’m more of a 80% homemade 20% premade kind of girl anyways. Just keeping it real. This recipe is easy enough to throw together on a weeknight, but looks really fancy. I love peas but any vegetable of your choice could bring a touch of green and freshness here. Watercress was in season and the bitter peppery taste really went well with the black pepper and otherwise creamy flavors in this pasta dish. I’m thinking that arugula would be a great alternative should you not be able to find watercress. Side note: I used one pan to make everything to spare myself from doing too many dishes, but it’s not necessary. Place saucepan back on the heat. Add olive oil and lay prosciutto slices flat in the pan, cook for 1-2 minutes until crisp, remove from pan and set aside. It will crisp up more as it cools - A plate lined with paper towel is great to absorb any extra oil. Add butter, garlic and parboiled pasta with peas to the saucepan. It will have that crispy prosciutto flavored oil in it - A great thing. Season everything with black pepper and chives, then sauté until lightly toasted in places - 5 minutes. Try not to stir too much so that the ravioli gets a good chance to get crispy. I did not add any salt to this because the prosciutto provides enough for us. 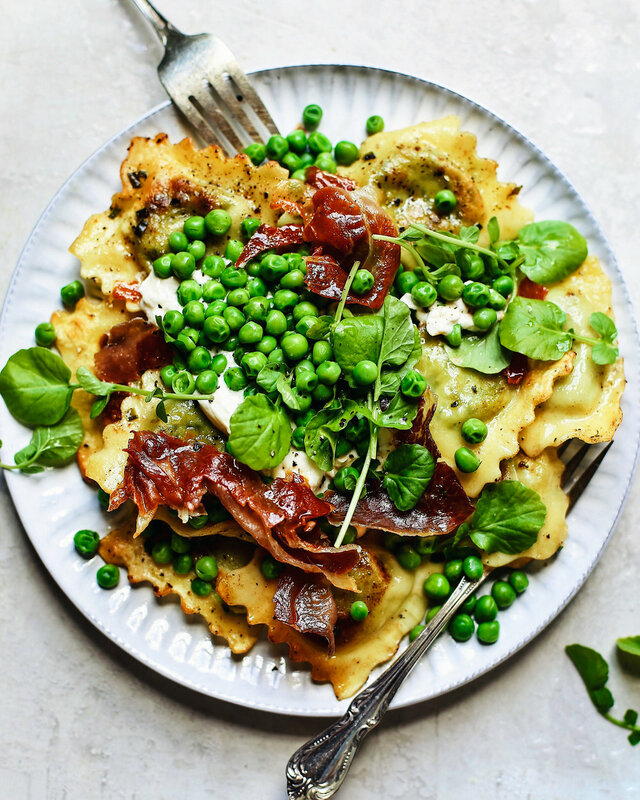 Remove from heat and divide pasta amongst serving dishes, followed by burrata which you just gently break apart and layer on top, followed by lemon juice and zest, then crumbled prosciutto and watercress.